Sometimes dubbed “narwahls” in Canada, the term “unicorn” is shorthand for a private company valued at more than $1 billion. The report used the ability to raise funds over time as a proxy for potential future value. At number five on the list, Kik is identified in the report as Canada’s only current “unicorn,” having received that valuation in 2015. Founded in 2009, this company’s core product is a chat platform made with teenagers in mind and they are a clear leader in chatbots. According to the Impact Centre, they have raised a total of $220.5M USD. Coming in at number six on the list, North recently received substantial international attention for the launch of their newest product: augmented reality glasses called Focals. Founded in 2012, North is one of Waterloo’s fastest-growing companies and the Impact Centre lists their total funding at $152.7M USD. Maclean's Magazine also put out a list of the ten Canadian startups that could become billion dollar companies, and North was on that one, too! The oldest Waterloo-based company on the list, D2L was ranked number 28. Founded in 1999, this company specializes in the development of educational platforms for K-12, higher education, healthcare, government and the enterprise sector. The Impact Centre lists their total funding at $165.0M USD. At number 30 on the list, eSentire is a huge Waterloo success story. Founded in 2001, this security innovator created an entirely new category of cybersecurity – managed detection and response – and their software-as-a-service product is used in more than 50 countries worldwide. The Impact Centre lists their total funding at $140.9M USD. Finally, coming in at number 31 on the list is Vidyard, creators of a platform that helps businesses transform communications and drive revenue through the use of strategic online video. They currently count global leaders and industry pioneers like Honeywell, Lenovo, LinkedIn, Citibank, Marketo and Sharp as customers. According to the Impact Centre, Vidyard has raised $60.7M USD. How has locating in Waterloo helped these companies grow? The answer is different for each, but all five have benefited from cost advantages associated with growing in a mid-sized urban centre. For example, in the last three years alone North has grown from fewer than 100 employees to more than 450 – Waterloo’s office rates have almost definitely made this more feasible than if they were located in downtown Toronto, Boston or New York, or in Silicon Valley. Waterloo’s other major advantage is access to new and experienced talent. 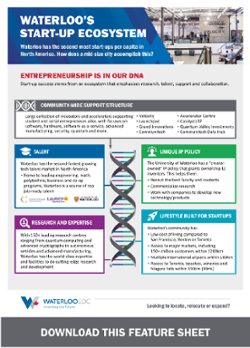 In a recent report, CBRE recently called our community’s combination of tech quality and cost “exceptional.” Waterloo businesses also have access to an advantageous immigration program called the Global Talent Stream that helps tech companies acquire visas and work permits for potential recruits in as little as two weeks. 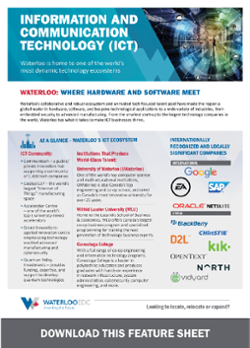 Finally, Waterloo is home to incredible post-secondary institutions, including the University of Waterloo, which is home to Canada’s #1 Computer Science program and #2 Engineering program. Wilfrid Laurier University and Conestoga College are also strong in tech-related programs, including software engineering and technology management. Read more coverage of this report at the Waterloo Record, or find the complete report here.